Have you ever lost a match and wondered later why you played the way you did? A missed »easy« ball, a double fault or bad line call upset you so much that you lost your composure and concentration. What happened was that you allowed your emotions to influence you. You were unable to think rationally. Or maybe you have been a victim of over thinking during critical parts of a match? Whenever you had the opportunity to finish the set or the match or to finally get that break of serve, your mind started running all those negative scenarios which eventually became reality. If you've experienced some or even most of these situations then this information is just what you have been looking for. 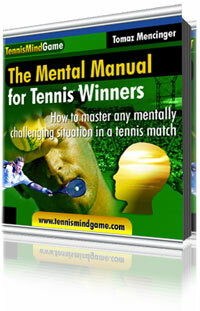 You're about to learn how to control your mind in even the most challenging situations during tennis matches. Surely you've noticed that some players are champions and keep winning tough matches and some players just don't make it big even though their tennis seems excellent. The best players know how to control their emotions, they know how to think in critical situations, they know how to regain and keep their concentration on a very high level for a long time. They also know exactly how to approach critical situations - they have a winning mindset. Their thinking is what makes them calm and focused. They know what they need to watch for and they know that even though they get emotional (think Lleyton Hewitt) they can find their ideal mental state very quickly. If you wish to progress in the mental area of tennis, this professional manual is an absolute must. It is easily understood and practical. How can you make your mind your best ally? First, you would need to: gather information from all the best books on the market about mental toughness, explore and combine the massive internet information base, attend seminars, workshops and do your own research by studying many matches on TV or tapes. Second, you would have to test the ideas in practice. Doing this by yourself will give you the best feedback. Coaching others and seeing how they react and improve in their own ways will also be helpful. Third, based on feedback, mistakes and successes, you would need to reduce all that information into manageable pieces. Then you would need to absorb and apply only the most proven and effective techniques of dealing with one's mind. You would then need to combine practical experiences and psychological theories for the best effect. Competitive experiences from other sports might also complement your knowledge. Fourth and very important, you would have to find an effective, quick and easy way of passing that condensed information to the player without overwhelming him, causing him to over-think or to overcomplicate things. You would have to present him with information that is understandable even for a complete novice in the field of psychology and mental toughness. I have been through the lengthy process described above. The result of all that methodical and hard work is the e-book I'm about to show you. I am a winner of many singles tennis tournaments, nationally certified coach and PTR Professional and have mastered my mind and emotions to become my own best ally during crucial and stressful times in matches. I have also studied general and sports psychology because I was aware how important the mental part is for peak performance. I speak from the experience of proven and successful strategies and also from the application of principles from sports psychology. How to finally get the edge in the most difficult tennis matches. The Mental Manual for Tennis Winners is your mental success coach in downloadable e-book format, which consists of condensed and proven strategies for achieving mental mastery. How would you play? What types of shots and combinations would you dare to play? At what level of your age group would you be? The manual can help you get as close as possible without doing special mental toughness training for years. During the game there is not much time to think, nor is thinking beneficial to your concentration. What you need to do is just get into a winning attitude and optimal emotional state to play the next few critical points. That's the purpose of the manual – not explanation or analysis of mental processes – just a few lines to get you in the right thinking mode and reminders of what to look for in the next crucial situation. This highly recommended manual is full of useful advice and practical applications. The main part of the manual consists of 29 potentially stressful situations in matches as well as making you aware of the trap of feeling too confident. For every situation you'll learn the correct winning mentality, how to adjust your emotions and approach the game with a positive attitude and focus on the task at hand. Another powerful tool is realizing the benefits of acceptance. If you fully and realistically grasp the meaning of acceptance (i.e. accepting the situation as something normal), you'll discover that the tools for controlling your thoughts and emotions are not needed anymore. You won't get distracted or emotional – you will just be focused on the process. That is what many sports psychologists and experienced athletes call »the zone«. This manual is excellent. It has only the most important points for every situation. Now I know what is going on during the match. And since the instructions are short and concise I actually remember most of them. There is also a section of guidelines on how to approach every situation in a »game«, depending on the score – 30:30, 0:40, 40:15, …They are based on common psychological mistakes players can make and how to turn most of them to your advantage. The last section explains and guides you through the correct way of analyzing the match. There is one typical mistake most players and coaches make in the match analysis and that's why the same mistakes happen again and again. You'll learn HOW to change that and actually gain confidence from every match. So who can most benefit from this manual? The player – who doesn't have to study big books on mental training and then extract the relevant information for himself. The manual can be printed out in a small format and stored in your tennis bag. Information for any given situation is short and concise and the player could check that during the changeover in just 30 seconds! The coach – who can add valuable insights and ideas to his knowledge base and find even more effective ways of passing that knowledge on to his players. The parent – young players are often escorted by their parents and without their coach. With this manual the parent finally has some short and proven guidelines to pass on to his child without panicking him or advising him in a field in which they are not experts. how to tap into the power of acceptance which has the potential to transform your thinking and consequently you won't lose focus or get upset at all. You'll just play, point by point, staying in the moment, and playing to the best of your abilities. I've read the "Mental Manual for Tennis Winners" and it's excellent that you have gathered mental tips from world tennis experts. I've been working with my coach on tennis psychology for quite some time and have read many books on this topic. I believe that if you really want to improve your tennis you have to put in a lot of effort in different areas and psychology is just one of those important ones. Watching and commenting a tennis match is much easier than playing it. Many people don't realize this since they have never been in a similar situation. I hope young players will use your manual and that it will help them improve their tennis game. How will all this information on mind mastery affect your future matches? Imagine just for a second playing a tough match with lots of controversy and difficult situations. And you just cruise through it. You are invulnerable to distractions and mental lapses. You may get emotional or lose your focus for a couple of seconds but you quickly find your zone again using the techniques from the manual. Even the few matches that you may eventually lose will not hurt your confidence and frustrate you. On the contrary, you'll know that you gave your best and will be able to correctly assess your performance and set new goals on how to improve your game. So what can you expect to gain after you get this e-book? Instant solutions – in a matter of seconds you can direct your thinking and control your emotions to be your best ally in even the toughest situations. Knowledge – one of the most (if not the most) horrifying situations in a match is when a player doesn't know what to do – he is lost in the problem and cannot find a way out (maybe he is not even looking for it) – we can easily say that he is »lost«. This is where one of the basic human needs (see Anthony Robbins) kicks in – the need for certainty. When players become uncertain of what to do, their need for certainty is not satisfied - this can cause enormous stress, especially when combined with an already stressful match situation. The result is a totally lost feeling of flow and concentration. The player plays nervously and anxiously with uncertainty eating away at him. If he plays a calm and focused competitor, he may be a much better player but the feeling of uncertainty will compromise his body coordination, his quick and smart decisions and his focus. The knowledge of how to deal with these situations will reassure the player and equip him with inner calm regardless of the situation. Confidence – once a player has short, concise instructions on how to deal with certain situations, he will feel confident and ready to meet them. He will feel challenge instead of fear. It's the same as when writing a test and not knowing the subject. You are bound to be anxious before the test. But if you excel in your subject then the test becomes a challenge and an opportunity to grow and feel even more confident after successful completion. Coaching is not allowed on most matches. The instructions in the manual are universal. Slovenian Davis Cup captain Marko Por wanted me to present a Slovenian print version even to the whole Davis Cup team. There is space allotted in the manual for your own ideas and advice - good tips and mental guidelines will work differently for each individual. You can include your own tips which you trust and know that work for you. The small printed format of the e-book allows you to conveniently keep it in your tennis bag and take a quick look during the changeover if you want to. Wouldn't it be a shame if you lost a match just because you forgot a great tip? After you get this e-book, this should not happen again. If you are serious about your tennis game then don't allow this to happen. Too many tennis players obsess over the technicalities of form, to the detriment of their play in the inner game. Tomaz Mencinger's Mental Manual for Tennis Winners is just that -- a concise courtside companion that can provide effective first aid for your mental game. Did you just lose your serve? Are you way ahead in a set and feeling like you're losing your edge? Grab the manual and turn to that situation in it. In the time you have between games, it tells you the few, brief, crucial things a good coach would say to bring the best out of you. The very act of doing this brings your attitude around to where it belongs and replaces negative thinking with positive thoughts on what you can do. Plus, the perspective, advice, and reminders you get help you master the inner game. You also get space to jot down your own personal reminders on how to handle the challenge in each situation. By using the Mental Manual this way, over time, these mental approaches become second nature. Therein lies the magic. And I highly recommend it. The edge – most of your opponents will not have this condensed knowledge bank at hand. You'll gain an instant edge over them. How will these super mental tips affect the outcomes of the matches with your greatest rival? I guarantee that you'll win more matches against him/her. Maybe not all of them since tennis is not all mental but I guarantee that your winning percentage will increase. The scales will inevitably tip in your favor, no doubt about that. Last but not least – gaining understanding about managing your emotions and thoughts (instead of fighting them) will open up new opportunities and give you more confidence in pursuing better business deals and expecting more from life. It will also help you to strive for more and strive for more joy and quality on your life's journey. Fear doesn't lead anywhere except living in a safe box of security. This same fear prevents us from looking for more quality and diversity in this wonderful game called life. How is this e-book different from other tennis mental books and e-books? The books on the market are fantastic material – for someone who loves to study, think and ponder on great ideas from experts in the field of mental toughness. They are also great for someone who has a lot of time, passion and interest to pursue this subject. But how about for a player? Does he have the time, knowledge and energy to extract the relevant information from all these many books? Can he avoid the trap of overthinking when presented with vast amounts of information? Paralysis by analysis is a common problem of tennis players, especially in this age of information. The tennis manual avoids this trap. It gives you the most relevant and proven tips to enable you to assess critical situations with a positive mindset, high energy and confidence. It contains all the most important information about mental and emotional mastery and even makes it accessable to 12 or 13 year olds. This was one of my primary objectives – I wanted to help kids too by making these mental techniques available to them at their level of understanding. Then everyone that is capable of looking at this very dynamic, interesting and beautiful sport in a different way - and most of all, is willing to do so - can be considered a winner. The Mental Manual for Tennis Winners can certainly open your eyes and prepare you for this path. Aleš Filipčič, tennis coach, Ph.D. It's also a book for every club player who hasn't attended various tennis workshops and read tons of books on tennis psychology. You don't have to have any previous knowledge about mental training. This manual can either be your starting point or the »tip of the iceberg«. This e-book will save you a lot of time since the information in it is condensed and focused. It will save you hours of searching for relevant information in other books. If you've taken lessons from a pro you know that a typical lesson costs between $30 and $60. And if you are not satisfied, you don't get your money back. And if you wanted to learn these mental tips from a pro, it could easily take you 10 to 15 lessons, just to skim over them. But I want you to improve and enjoy your game sooner and for a better price. That's why I'm offering this tennis mental e-book for only $19 - and you can obtain it instantly with the power of the internet! Bonus #1: Receive 3 email answers to your most burning and troubling questions about mental approaches to tennis. Actually, you can ask anything about tennis or psychology and how to solve your problems. (Value $25). Bonus #2: Receive an exclusive report: "A Kind of Magic - Bringing the Best Out of Your Partner" by Kathy Krajco, author of Tennis Doubles Strategy & Tactics guide. It explains the mental bond of the successful doubles teams and how to get there. (Value $10). Bonus #3: Receive "The Laws of Tennis Psychology" by Bill Tilden, winner of 14 singles Grand Slam titles. At least in those days Tilden may have spent more time analyzing the tennis game than anyone else. Learn how masterfully Tilden understood the human psyche and apply his tips to your game. (Value $10). Receive "Tennis Fitness Tips" by Todd Scott, a training advisor to Men's Fitness and Muscle & Fitness Hers magazines. When you are physically fit it gives you the confidence to grind it out to the end. (Value $37 (still free at the moment)). You have 60 days to try and test these mental tennis tips in real play and if you feel that your improvement is not worth the money then contact me and I'll refund you 100% of your purchase price without any questions asked. And you get to keep the bonus ebooks! That's a $57 value. What you will be investing in today is your tennis game. This ebook is downloaded immediately. Delivery may take around 20 seconds depending on your connection speed. Once you order you'll be taken to Clickbank secure server to make the payment and then you'll be redirected to the download page where you'll be able to download the manual in PDF format. P.S. Given the remote chance that a critical situation familiar to you is not included in the e-book, you can email me and I'll do my best to find a solution for you. P.P.S. And since I look forward to improving your mental game in tennis I'd love to hear from you how the manual worked for you. Thanks!